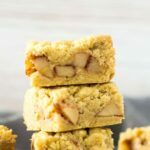 Apple Crumble Bars – Deliciously soft and buttery crumble bars that are filled with juicy cinnamon-coated apple chunks. A perfect way to kick-start your autumn baking! 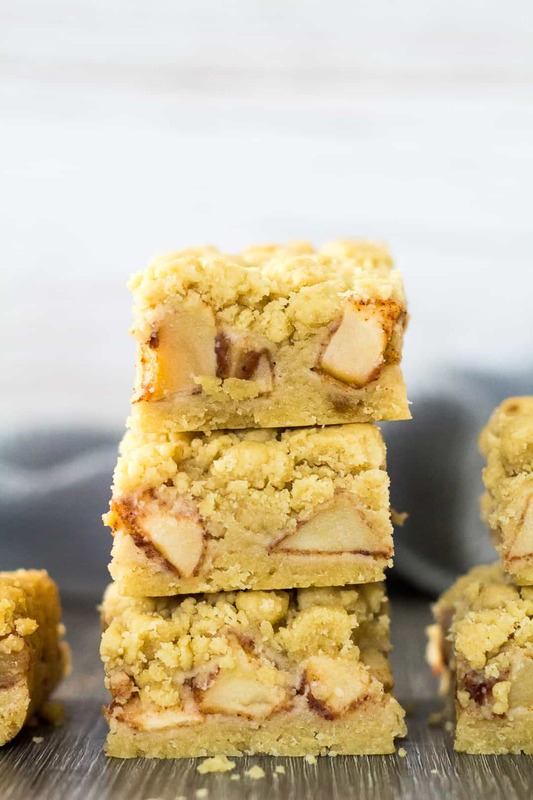 These bars are made up of two thick and buttery crumb layers (seriously, so good! ), and filled with a layer of juicy apple chunks that are generously coated in cinnamon. Apples: You’ll need 4 small/medium apples. 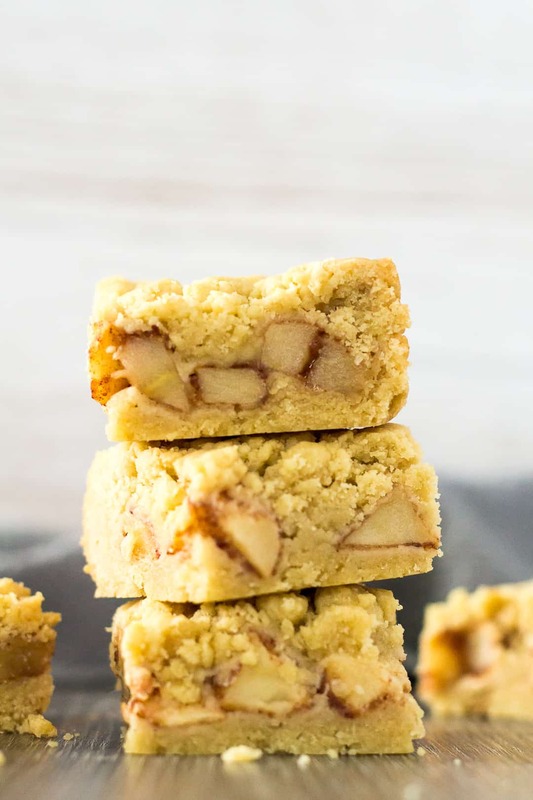 To make these Apple Crumble Bars, simply whisk together the melted butter, sugar, and vanilla. Add the flour, baking powder, and salt, and mix together using a fork to create a crumbly mixture. Press half of the crumb mixture into the base of an 8×8-inch square baking pan lined with parchment paper or foil. Add the apple chunks to a small bowl, and mix in the lemon juice, cornflour, and spices until the apples are fully coated. 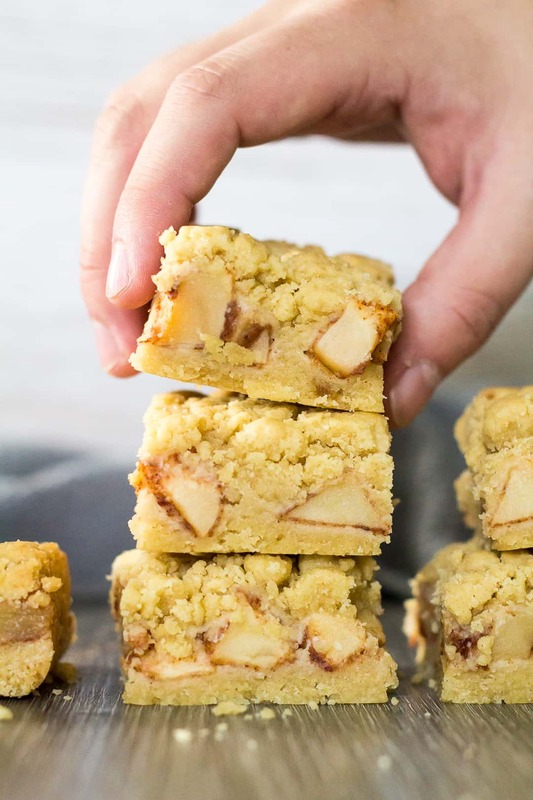 Spoon the apple chunks on top of the crumb base and spread out evenly. Top the apples with the remaining crumble mixture, and press down gently. Bake for 35 – 40 minutes until golden brown around the edges. Allow to cool completely in the pan on wire rack before cutting into bars. I like to place my pan in the freezer for 1 – 2 hours to speed up the cooling process. How long will these bars last? These bars will stay fresh, stored in an airtight container, at room temperature or in the fridge for up to 1 week. Can I freeze these bars? These bars can be kept frozen for up to 3 months. Thaw them overnight in the fridge before serving. 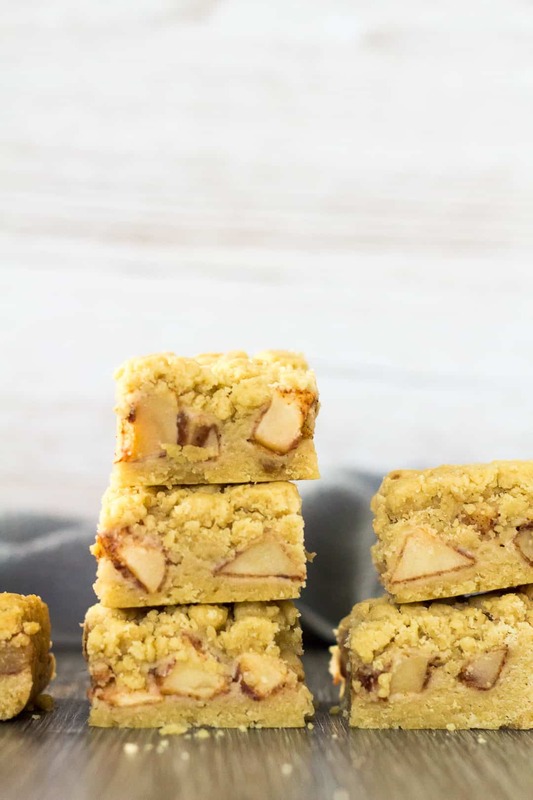 Deliciously soft and buttery crumble bars that are filled with juicy cinnamon-coated apple chunks. A perfect way to kick-start your autumn baking! Whisk together the butter, sugar, and vanilla. Add to the dry ingredients and mix in with a fork to form a crumbly mixture. Press half of the mixture into the base of the prepared pan. Add the apple chunks to a small bowl. Mix in the lemon juice, cornflour, and spices until the apples are fully coated. Spoon the apples over the base, and spread out evenly. Sprinkle the remaining crumble mixture on top of the apples, pressing it down gently. Bake for 35 - 40 minutes until golden brown around the edges. Allow to cool completely in the pan on wire rack before cutting into bars. I placed my pan in the freezer for 1 - 2 hours to speed up the cooling. These look so good! I’ll definitely be making these soon! I need these bars, ASAP! No wonder your family loved them, just look at them! So loving the apple chunks. I’ve been addicted to all things apple since the beginning of September. I’m excited to try your recipe now that I’ve found it. It looks incredible! !